The application for the Dr. William P. Foster Separate Entity Scholarship and Book Vouchers is now closed. The application deadline was December 28, 2018. Homecoming is in the air, and we're looking forward to seeing you in Bragg Memorial Stadium on Saturday, October 6th! A lot of work has gone into the planning of the weekend's events, and we are in preparation mode, so get those horns out, do some stretching, and let's get ready to give Bragg a performance that they won't forget! This year's band camp will be held on July 7-14, 2018, at Florida A&M University! If you haven't been to our beautiful campus, now is the perfect time to come and enjoy being with students like yourself, and learning how to improve your musicianship by being taught by the best counselors and staff in the world! 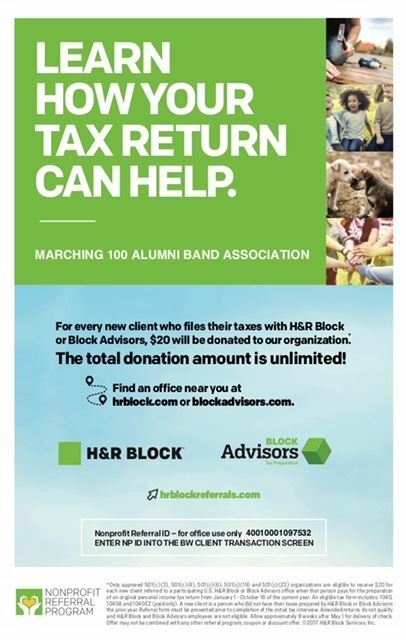 The Marching 100 Alumni Band Association will be partnering up with HR Block this tax season. HR Block will donate $20 for every client that files his or her taxes at any HR Block location. Make sure you bring the flyer posted below to your HR appointment to get the credit for the organization. On your first visit to AmazonSmile smile.amazon.com, you need to select a charitable organization to receive donations from eligible purchases before you begin shopping. Amazon will remember your selection, and then every eligible purchase you make at smile.amazon.com will result in a donation. You can put the name Marching 100 Alumni Band Association in the search engine. The application for the Dr. William P. Foster Separate Entity Scholarship and Book Vouchers are now open. The application period is from July 1-31, 2017. This year's band camp will be held on July 8-15, 2017, at Florida A&M University! Interested in being in that number this summer with a scholarship from the Marching 100 Alumni Band Association? Click on the link below and to learn more about the Band Camp Scholarship. The application deadline is April 30, 2017.